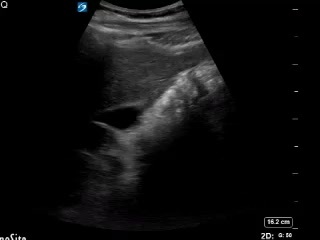 There is a small amount of fluid visible at the tip of the liver. 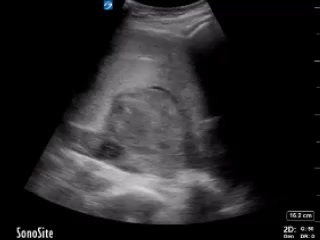 The obstectrics and gynecology registrar looks at your scans as says this is not a ruptured ectopic because there is no free fluid in the pelvis and only a small amount in the RUQ. 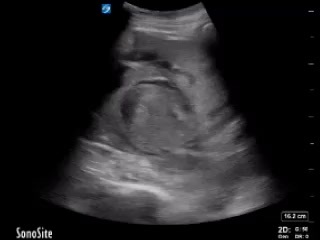 Your response is to explain the pelvic scan to her. 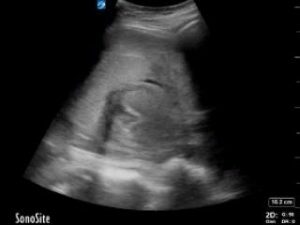 The pelvis is full of echogenic clotted blood which is why it does not appear anechoic. 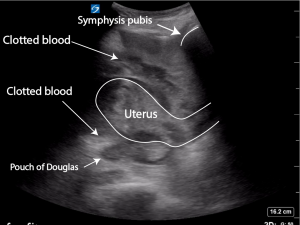 The echogenic blood is surrounding the uterus and filling the entire pelvis. 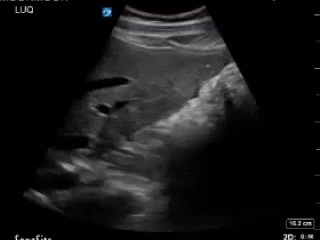 You can see this is blood because it has a mixed echogenicity. 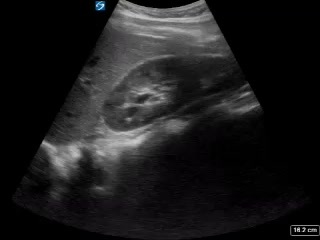 It is not bowel because it is not moving, and there is no dirty shadowing from gas. The reason why there is no fluid in the RUQ is because the woman has just been laid supine and therefore free fluid from her pelvis has not yet moved to her RUQ. A scan in 10 minutes will show more fluid. 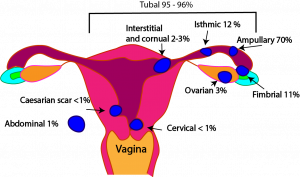 You have also identified the possible ectopic. Having said that, this is irrelevant in the context of the empty uterus and the pelvis full of blood. Meanwhile the patient’s BP is deteriorating. Her repeat Hb is 55. The massive transfusion protocol is activated. She is urgently transferred to theatre where a ruptured cornual ectopic is removed. 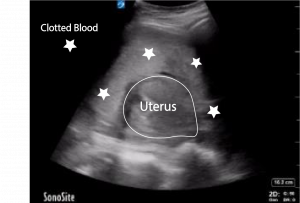 In theatre the uterus is found to be surrounded by approximately 3 l of clotted blood. She makes a good recovery. 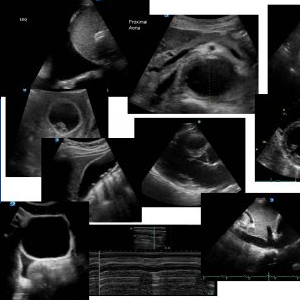 If ultrasound is to be used to guide management then credentialing is paramount. 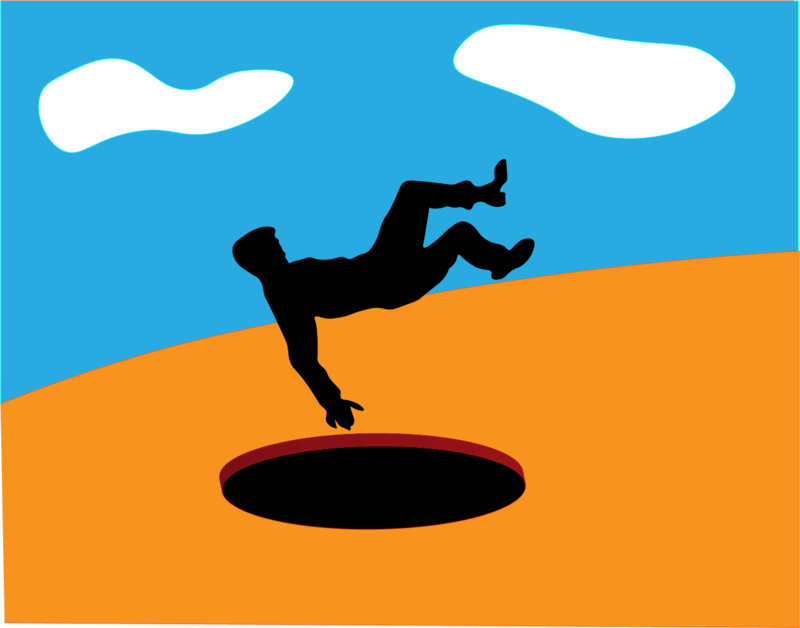 Bad decision making and delay in treatment can be the product of poor understanding of ultrasound in some cases. 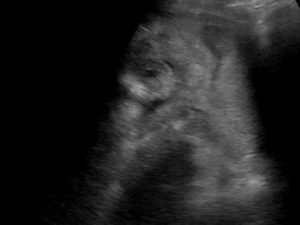 Because of the abundant blood supply in the cornual region from both uterine and ovarian vessels, rupture occurring after 10 – 12 weeks of gestation often leads to severe catastrophic haemorrhage and even death. The mortality rate is 6 – 7 times higher than that of ectopic pregnancies. 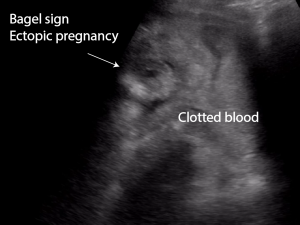 Teaching point : The greatest pitfall of ultrasound in the context of an ectopic pregnancy is not recognising that blood in the pelvis clots quickly. 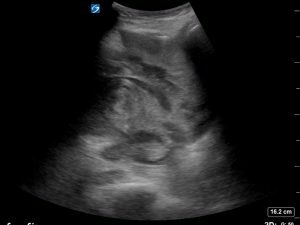 The second greatest pitfall is not to recognise that if a patient has been sitting for a while or standing and is then examined immediately supine, there may not be free fluid in Morison’s pouch simply because the blood has not had time to flow to the RUQ from the pelvis. 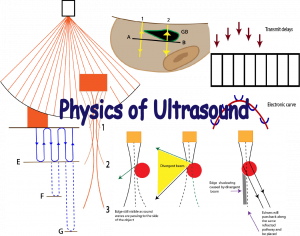 Ultrasound can be used sequentially. Re examine the patient 10 minutes later to see whether there has been any accumulation of fluid. This entry was posted in Cases, Ectopic. Bookmark the permalink.